It’s not a matter of if, but when and how much money it’s going to cost residents in Preston. Preston City’s sewer and water systems are aging and in need of a major overhaul, according to city leaders. They say a utility rate increase is not only inevitable but should be done immediately. The city is facing three proposals which will cost millions of dollars. Residents of Preston are being asked to help pay for the needed repairs and new infrastructure. The recommended rate increase could cost residents anywhere from an additional $25 to $50 a month per household. 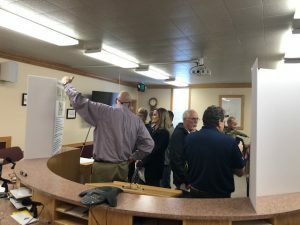 During the first of three town meeting open houses on January 10th, more than 30 residents showed up at the Preston City Hall to offer advise to city leaders. The most urgent need according to a recent infrastructure committee report is replacement of the city’s sewer treatment plant. As it stands, the plant does not meet current Department of Environmental Quality (DEQ) regulations. The city has been given a deadline to come into compliance or face stiff fines. City Councilman Brad Wall says there are few options. The city also has just one source for its drinking water. Councilman Wall said leaders are concerned what would happen if the system failed. The committee is proposing a number of ideas for a secondary water source including the construction of a new water treatment facility. “Right now we draw all our water out of Berquist Springs,” Wall said. “That provides all of the drinking water for Preston and it’s our only source of culinary water. What’s been identified as a priority is to have a second source of culinary water. And then there is the aging water delivery system. The committee suggests a new water main line be constructed in the event the current pipeline fails. The city is looking for more citizen input and is holding two additional town meetings. They are scheduled for January 14th and 23rd, from 6:30 p.m. to 8:30 p.m. at the Preston City offices.